Dubai, UAE, April 25, 2018: The MBA and BBA students of Skyline University College (SUC) along with SUC Professor, Dr. Nizar M.F. Sahawneh attended a 3-day training program on “Capital Markets: Products, Risk, and Strategies” at New York Institute of Finance during the Skyline Educational Trip in New York, USA on March 21-31, 2018. The course surveys the major financial instruments traded in capital markets around the world, which allowed students to understand how stocks are valued, learn how stocks and bonds are brought to market, and understand the basic mechanics and risks characteristic of derivatives. The program was conducted by Mr. Chris Thomas, Managing Director of Massey Quick Simon-Wealth Management Investment Consulting. Deputy General of the Consulate General of the United Arab Emirates-New York, H.E. Anwar E. Alazizi, graced the last day of the program and awarded the certificates to the students. 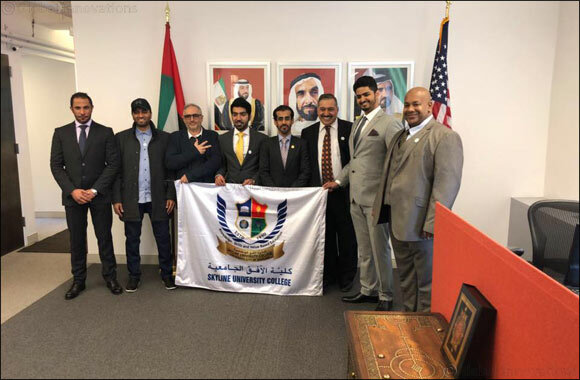 The training program was reviewed by the UAE Consulate in New York, and have offered to attest the certificates obtained by the students from New York Institute of Finance. The UAE consulate also pledged to sponsor SUC should there be another training program in New York. Moreover, the educational trip included a visit to the New York Stock Exchange in Wall Street where the SUC team was personally escorted by Mr. Kenneth Polcari, Managing Director of O'neil Securities for an actual learning experience. Similarly, the students have visited the Empire State Building and Statue of Liberty and grabbed the opportunity to watch a theatrical play of 'The Lion King' in Broadway, NY.